Gary Wayne Kubiak (born August 15, 1961) is an American football coach and former player who is the current head coach of the Denver Broncos of the National Football League (NFL), a position he has held since January 2015. He previously served as head coach for the NFL's Houston Texans from 2006 to 2013. Kubiak played as a quarterback for the Broncos from 1983 to 1991, as the backup to John Elway. Kubiak has participated in seven Super Bowls, losing three as a player with the Broncos, winning three as an assistant coach with the Broncos and the San Francisco 49ers, and winning Super Bowl 50 as the head coach of the Broncos over the Carolina Panthers. Kubiak passed for a then state-record 6,190 yards as a quarterback for St. Pius X High School of Houston, Texas, where he was given the nickname "Koob". Twice named to the all-state football, basketball, baseball and track teams, he was inducted into the Texas High School Football Hall of Fame in 1999. Kubiak graduated St. Pius X in 1978. Kubiak attended Texas A&M University under coaches Tom Wilson and Jackie Sherrill and was selected to the All-Southwest Conference team in 1982 after leading the conference in passing yards (1,948) and touchdowns (19). As a junior, he set a conference record by throwing six touchdown passes against Rice. Kubiak was selected in the eighth round of the 1983 NFL Draft by the Denver Broncos, the same year quarterback John Elway was drafted No. 1 overall by the Baltimore Colts before forcing a trade to Denver. Kubiak played his entire career for the Broncos as a backup for Elway, a Hall of Famer. In nine seasons, Kubiak went 3–2 as a starter, throwing for 14 touchdowns, 16 interceptions and 1,920 yards while part of three AFC championship teams. Kubiak replaced Elway at the end of the Broncos' defeats in Super Bowl XXI and Super Bowl XXIV. Kubiak began his coaching career at Texas A&M, his alma mater, serving as the running backs coach for two seasons (1992–1993). He worked extensively with All-American running back Greg Hill, who was selected by the Kansas City Chiefs in the first round of the 1994 draft. Kubiak won his first Super Bowl serving as the quarterbacks coach for the San Francisco 49ers in 1994, guiding Hall of Fame quarterback Steve Young to one of his best seasons. Young received his second NFL MVP and captured Super Bowl XXIX MVP honors by throwing a record six touchdowns in San Francisco’s 49–26 win over the San Diego Chargers. 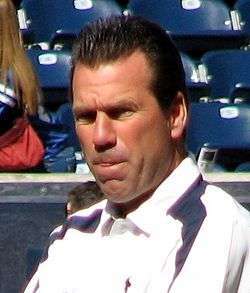 Kubiak went to the Broncos the following season when Mike Shanahan, who was previously the 49ers offensive coordinator, became Denver's head coach. In 11 seasons (1995–2005) as the team's offensive coordinator and quarterbacks coach, Kubiak helped lead Denver to two Super Bowl titles (1997, 1998), which were also the final two seasons of John Elway's playing career. In his 11 seasons with the team, the Broncos amassed 66,501 total yards and 465 touchdowns, the most in the NFL during that span. He coached 14 different Broncos that made the Pro Bowl, including running back Terrell Davis, who was named the NFL MVP in 1998. Kubiak was named the second head coach in Houston Texans history on January 26, 2006, replacing the fired Dom Capers. In his first season with the team, Houston finished fourth in the AFC South with a 6–10 record. The Texans ended the 2007 season at 8–8, a non-losing record for the first time in team history. The Texans had their second non-losing season, again finishing 8–8, in the 2008 season. The following season under Kubiak, the Houston Texans achieved their first winning season in franchise history, when they overcame a 14-point fourth-quarter deficit to defeat the New England Patriots 34-27 at NRG Stadium, formerly Reliant Stadium, finishing the 2009 season 9-7. They missed the playoffs on a tiebreaker with the New York Jets. On February 2, 2010, with a year left on the original deal he signed, the Texans' signed Kubiak to a three-year contract extension through 2012. In the 2010 season, Houston started off strong with a record of 4–2 heading into their bye week (Week 7). But Kubiak's promising campaign quickly turned disastrous as the Texans lost 8 of their final 10 games placing them 3rd in the AFC South, with a record of 6–10. The Texans ended up 4th in passing yards, 7th in rushing yards, and 3rd in overall yards. The 2010 Texans defense was arguably one of the worst in the league finishing last in passing yards allowed and tied for last in passing touchdowns allowed. The Texans responded to the 2010 poor defensive showing by firing defensive coordinator Frank Bush, secondary coach David Gibbs, linebackers coach Johnny Holland and assistant linebackers coach Robert Saleh. Kubiak, a ball boy for beloved former Houston Oilers head coach O.A. "Bum" Phillips in the 1970s, hired long-time friend, and son of Bum, Wade Phillips to take over as the Texans new defensive coordinator on January 5, 2011. Phillips became available after being fired as head coach of the Dallas Cowboys halfway through the 2010 season. Phillips was allowed to bring in his own assistant coaches. The Texans signed two high profile free agent defensive backs, Johnathan Joseph and Danieal Manning, and used their first five draft picks, including two in the Second Round of the 2011 NFL Draft, on more defensive players. The 2011 NFL lockout limited the time coaches had with players in preseason, but Phillips turned the defense he took over from 30th overall in 2010 to 2nd overall in 2011. Despite debilitating injuries to elite players including wide receiver Andre Johnson and NFL top running back Arian Foster, as well as the devastating November 13, 2011 loss of NFL Top 10 quarterback Matt Schaub for the season, the Texans secured their first AFC South Championship and first appearance in the NFL playoffs. The Texans, with rookie fifth-round selection T.J. Yates at quarterback, defeated the Cincinnati Bengals 31-10, January 7, 2012 in the first playoff game in franchise history, with a record crowd of 71,725 at NRG Stadium, formerly Reliant Stadium. Kubiak was named the AFC Coach of the Year by NFL 101 after leading the Texans to a 10-6 regular season record and the franchise’s first division crown, playoff berth and playoff win in 2011. Texans owner Bob McNair rewarded Kubiak with a new three-year contract on June 14, 2012. Kubiak turned down a four-year deal for one that expires after the 2014 season. The 2012 season saw the Texans start 5-0 for the first time in the franchise's history. The Texans would finish the season a franchise-best 12-4 and beat the Cincinnati Bengals in the AFC Wild-Card Round for the second straight year before falling to the New England Patriots 41-28 in the divisional round. On November 3, 2013, Kubiak collapsed as he was walking off the field at halftime of the team's game against the Indianapolis Colts. He was put on a backboard and stretcher and transported to the hospital as a precautionary measure. Initial reports state that he did not have a heart attack. An NFL report on Monday, November 4, 2013, indicated that he had suffered a "transient ischemic attack" (a TIA), or relatively brief, non-permanent symptoms of disorientation, confusion, dizziness, forgetfulness, and/or vertigo (among many other possibilities), that occurs when a blood vessel or vessels in part(s) of the brain are temporarily but not permanently blocked, usually by a stationary clot (a thrombus) or one that has broken off and traveled to occlude another area (an embolus). Especially if they are not properly treated in a timely manner the way the coach's was, they can mean that a more permanent stroke (or cerebrovascular accident, CVA) can and likely will eventually happen. In Kubiak's absence for the second half between the Colts, defensive coordinator Wade Phillips assumed the head coaching duties and was the acting head coach for the remainder of the game. On December 6, Kubiak was fired from the Houston Texans with three games remaining in the 2013 season. He finished the 2013 season with a record of 2–11 and was replaced by defensive coordinator/interim head coach Wade Phillips. He had a 61–64 regular season record and a 2–2 playoff record in his Texans career. On January 27, 2014, Gary Kubiak signed with the Baltimore Ravens to be their new offensive coordinator. He served one season under John Harbaugh, replacing Jim Caldwell, who signed as the head coach of the Detroit Lions in the offseason. As the offensive coordinator, Kubiak installed his version of the West Coast offense passing game combined with a zone-blocking scheme that gave way to play-action passes Under his guidance, the Ravens had their most successful offense in 19 years, with quarterback Joe Flacco and running back Justin Forsett achieving career single-season highs in yards and touchdowns. Thanks in part to Kubiak's re-tooling of the offense, the Ravens returned to the playoffs after a one-year absence. Due to his success in Baltimore, Kubiak became highly sought after as a head coaching candidate, receiving interest from the New York Jets, Chicago Bears and San Francisco 49ers. The Ravens made a big push to retain Kubiak as the offensive coordinator for the next season, and Kubiak at first seemed committed to staying in Baltimore. It was not until he received an offer from friend and former teammate John Elway to coach his former team, the Denver Broncos, that Kubiak expressed interest in a new head coaching position. On January 18, 2015, Kubiak signed a 4-year deal to become the head coach of the Denver Broncos, after Broncos general manager John Elway dismissed head coach John Fox for two poor playoff eliminations. Wade Phillips, a former Broncos head coach, returned to the team to serve his second stint as Defensive Coordinator. Under Kubiak, the Broncos planned to install a run-oriented offense with zone blocking to blend in with quarterback Peyton Manning's shotgun passing style, but struggled with numerous changes and injuries to the offensive line. In addition, the 39-year-old Manning had his worst statistical season since his rookie year due to a plantar fasciitis injury in his heel that he had suffered since the summer. Despite the offensive struggles, the Broncos were carried by their defense led by defensive coordinator Wade Phillips, who replaced his predecessor's complicated read-and-react scheme with a simple aggressive approach of attacking the ball, the Broncos' defense ranked No.1 in total yards allowed, passing yards allowed and sacks, and like the previous three seasons, the team continued to set numerous individual, league and franchise records. Though the team had a 7–0 start, Manning led the NFL in interceptions. In Week 10, Manning suffered a partial tear of the plantar fasciitis in his left foot. He set the NFL's all-time record for career passing yards in this game, but after throwing four interceptions, Kubiak benched Manning favor of backup quarterback Brock Osweiler, who took over as the starter for most of the remainder of the regular season. During the Week 17 regular season finale, however, where the Broncos were losing 13–7 against the 4–11 San Diego Chargers, Kubiak benched Osweiler and Manning re-claimed the starting quarterback position for the playoffs by leading the team to a key 27–20 win that enabled the team finish the 2015 regular season with a 12-4 record, winning the AFC West and securing the number one playoff seed in the AFC. In the postseason, they defeated the Pittsburgh Steelers 23-16 in the Divisional Playoff round and the New England Patriots 20-18 in the AFC Championship, advancing to Super Bowl 50. The Broncos defeated the Carolina Panthers 24-10 in Super Bowl 50, winning the title and giving Kubiak his first Super Bowl win as a head coach. Kubiak became the fourth head coach to win a Super Bowl in his first season with a team, after Don McCafferty, George Seifert, and Jon Gruden. Kubiak became the third head coach in NFL history to win a Super Bowl with the same team that he once played for, joining Mike Ditka and Tom Flores, and is the first person to have played in the Super Bowl and later win it as a head coach both with the same team. Kubiak and his wife, Rhonda, have three sons: Klint, Klay, and Klein. Klint was a wide receivers coach at the University of Kansas in 2015, and in February 2016, was hired by the Denver Broncos as an offensive coaching assistant. From 2005–2009, Klay was a quarterback at Colorado State. Klein played wide receiver for Rice University and is now the Southwest Area Scout for the Broncos. ↑ "Inductee". Texas High School Football High of Fame. Archived from the original on 2010-09-16. Retrieved 2009-03-16. ↑ "Driven: Elway propels Broncos into AFC title game". Sports Illustrated. 1992-01-13. Retrieved 2009-03-16. ↑ "Gary Kubiak's NFL statistics". Pro Football Reference. Retrieved 2009-03-16. ↑ "Kubiak joins Texas A&M". New York Times. 1992-01-19. Retrieved 2009-03-16. ↑ "Transactions". Seattle Times. 1994-02-27. Retrieved 2009-03-16. ↑ "N.F.L., From Backup to Boss". New York Times. 1995-02-07. Retrieved 2009-03-16. ↑ "Texans to hire Denver O-coordinator Kubiak as coach". espn.com. 2006-01-23. Retrieved 2009-03-16. ↑ "Texans achieve their first winning season". houstontexans.com. Jan 3, 2010. ↑ "Real excited Kubiak says he has new three-year deal with Texans". Associated Press. February 2, 2010. ↑ "2010 Houston Texans". pro-football-reference.com. April 2, 2011. ↑ "Texans keep coach Gary Kubiak". espn.com. 2011-01-03. ↑ "Texans hire Wade Phillips". espn.com. 2011-01-05. ↑ "Cowboys' Wade Phillips fired". espn.com. November 9, 2010. ↑ "A Defensive Draft". houstontexans.com. April 29, 2011. ↑ "Texans earn historic playoff victory, beat Bengals 31-10". Houston Chronicle. ↑ "Texans extend contracts of Gary Kubiak and Rick Smith". houstontexans.com. June 14, 2012. ↑ "Securing Kubiak, Smith provides franchise stability". Houston Chronicle. 2012-06-14. ↑ "Running game on each side of ball has Kubiak searching for answers". Houston Chronicle. Oct 1, 2012. ↑ "Gary Kubiak collapses on Reliant Stadium field before halftime". CBS Sports. Retrieved 4 November 2013. ↑ Fox Sports. "NFL". FOX Sports. Retrieved 24 January 2016. ↑ "Gary Kubiak suffered mini-stroke during Texans' game". NFL.com. Retrieved 24 January 2016. ↑ "Gary Kubiak in hospital after collapse". ESPN. 4 November 2013. Retrieved 5 November 2013. ↑ "Gary Kubiak suffered mini-stroke during Texans' game". NFL.com. 4 November 2013. Retrieved 5 November 2013. ↑ Sessler, Marc. "Gary Kubiak out as Houston Texans head coach". nfl.com. Retrieved 6 December 2013. ↑ Ginsburg, David (Jan 27, 2014). "Ravens hire former Texans coach Gary Kubiak as offensive coordinator". The Washington Times. Retrieved 14 January 2015. ↑ Barnwell, Bill (Jan 25, 2016). "How Denver's coaching retreads toppled the Patriots". 'ESPN'. Retrieved August 12, 2016. ↑ Mink, Ryan (Sep 10, 2016). "Ravens Facing The Creator of Their Offense, Gary Kubiak". Baltimore Sun. Retrieved 28 August 2016. ↑ Preston, Mike (Jan 29, 2016). "Ravens' biggest loss last offseason, Gary Kubiak, taking advantage of second chance as head coach". The Baltimore Sun. Retrieved August 12, 2016. ↑ Hensley, Jamison (Jan 18, 2015). "No one should blame Gary Kubiak for leaving Ravens". 'ESPN'. Retrieved August 29, 2016. ↑ Patra, Kevin. "Broncos finalizing a four-year deal with Gary Kubiak". NFL.com. Retrieved 19 January 2015. ↑ Troy E. Renck The Denver Post (18 January 2016). "Peyton Manning, Broncos beat Steelers, punch ticket to AFC championship game". Retrieved 24 January 2016. ↑ "Super Bowl 2016: Peyton Manning's Denver Broncos overwhelm Carolina Panthers". The Guardian. February 8, 2016. Retrieved February 9, 2016. ↑ Sean Wagner-McGough. "Super Bowl 50: How Broncos coach Gary Kubiak can make NFL history". CBSSports.com. Retrieved 1 February 2016. ↑ "Klint Kubiak coach profile". KUAthletics.com. ↑ Jhabvala, Nicki (February 16, 2016). "Klint Kubiak leaves post at Kansas to be Broncos offensive assistant". The Denver Post. Retrieved February 16, 2016.